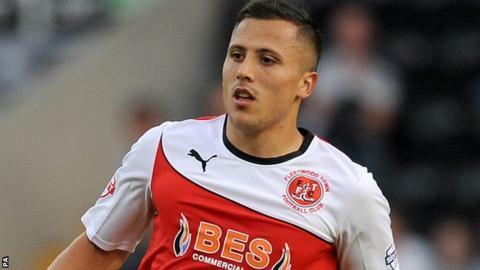 Fleetwood boosted their promotion hopes with a comfortable win over play-off hopefuls Oxford. The visitors took the lead as Antoni Sarcevic's cross found its way to David Ball, who tapped in at the far post. Sarcevic then doubled the lead with a fierce 20-yard drive from a free-kick. The visitors were rarely troubled, with David Connolly's saved shot on the turn the only real noteworthy attempt for the U's. Oxford drop out of the top seven for the first time this season while Fleetwood close in on third-placed Chesterfield, who drew 1-1 with Newport. Match ends, Oxford United 0, Fleetwood Town 2. Second Half ends, Oxford United 0, Fleetwood Town 2. Attempt missed. Nicky Wroe (Oxford United) right footed shot from the right side of the box is close, but misses to the right. Corner, Oxford United. Conceded by Conor McLaughlin. Corner, Fleetwood Town. Conceded by Michael Raynes. Attempt missed. Josh Ruffels (Oxford United) right footed shot from the centre of the box is too high. Jake Wright (Oxford United) wins a free kick in the attacking half. Foul by Jon Parkin (Fleetwood Town). Attempt saved. Dave Kitson (Oxford United) header from the centre of the box is saved in the top centre of the goal. Substitution, Fleetwood Town. Jon Parkin replaces David Ball. Attempt missed. Nicky Wroe (Oxford United) right footed shot from outside the box is too high. Corner, Oxford United. Conceded by Charlie Taylor. Substitution, Fleetwood Town. Gareth Evans replaces Iain Hume. Alan Goodall (Fleetwood Town) wins a free kick on the right wing. Foul by Dave Kitson (Oxford United). Iain Hume (Fleetwood Town) is shown the yellow card. Foul by Iain Hume (Fleetwood Town). Matty Blair (Fleetwood Town) is shown the yellow card. Attempt missed. Matty Blair (Fleetwood Town) right footed shot from outside the box is too high. Charlie Taylor (Fleetwood Town) wins a free kick on the right wing. Foul by Scott Davies (Oxford United). Ryan Williams (Oxford United) wins a free kick on the left wing. James Constable (Oxford United) wins a free kick on the left wing. Foul by Nathan Pond (Fleetwood Town). Attempt blocked. Josh Morris (Fleetwood Town) left footed shot from outside the box is blocked. Jake Wright (Oxford United) is shown the yellow card. Iain Hume (Fleetwood Town) wins a free kick in the defensive half. Attempt blocked. James Constable (Oxford United) right footed shot from outside the box is blocked. Attempt saved. Iain Hume (Fleetwood Town) right footed shot from the centre of the box is saved in the centre of the goal. Charlie Taylor (Fleetwood Town) wins a free kick in the attacking half.